What had seemed like a good idea, to do a guided walking tour around Arundel, was not quite so good as it perhaps could have been because stupidly I had told everyone to be ready at 10am. What I had not factored in was that at least 10 people would come back to my house and drink whiskey until 2.30am the night before. So the rather slow walk commenced a little after ten in some grudging sunshine. As we were walking I received a text from The Wingco, the worlds worst time keeper, to say that he had missed his flight from Nice and was on the next one. That this was not a surprise says a great deal about his time keeping. It is well known in the south of France that a “Wingco” is a unit of time which equates to around 7 minutes. He is regularly a dozen or so Wingco’s late for an appointment, and yesterday it was an appointment with Easyjet that was the focus of his personal Wingco’s. Thereafter I organised for those staying in Arundel for last nights pre 60th birthday celebration to walk or be driven to the Black Rabbit. One large Bloody Mary was my maximum indulgence so that I would be fully able to enjoy the festivities last night. To be fair, I was not at my best after the night before, but manfully I remained in the pub with the partying throng, studiously avoiding the offers of strong drink. And so to the big event. The gathering point was The White Hart, where the evening bar take was doubled in about 20 minutes as the thirsty ex pats assuaged their parched throats in spectacular fashion. I was told that I had to be the last to arrive, and I was to be blindfolded by Sprog 1 before being lead to my place for dinner. When the blindfold was released I was confronted by the entire party wearing false moustaches, a picture of one of which is today’s photo. What is more, I was the only man on the big table full of the my gorgeous girl friends. I had managed to get into my kilt with surprising ease and, with a table full of gorgeous and inquisitive females, it was perhaps inevitable that a few of them are now a little less uncertain about traditional Scotsman’s undergarment arrangements. Happy days! After a sumptuous dinner at the Roundhouse in Arundel, some of the tables are cleared ready for a brief impromptu appearance of one my favourite duos, the very wonderful John Otway and Wild Willy Barrett. Both are amongst my oldest pals, having been my friends for over 40 years and they played a mesmerising set of bluegrass, country and Otway/Barrett classics, Wild even sawing up a guitar whilst playing one of what he calls Otway’s soppy songs, “Geneva”. They had played at my 50th birthday, which coincidentally, was almost exactly 10 years earlier. Then they had a PA so they had a microphone stand and had subjected me to participation in a touching little tune called Headbutts, which involved me being made to headbutt the microphone, much to the hilarity of the assembled guests. Last night, I knew they were playing acoustically so that no microphone abuse could be visited upon me, however, inventive as always, Wild adapted the “song” enabling him to hit me with the guitar instead. The dinner over, a good proportion of the less sensible adjourned to my house where we drank loads of wine, smoked countless Monte Christo’s, witnessed Ziggy, my Norwegian pal do an opera trained vocal version of My Way and sang whilst the Wingco played. An absolutely splendid evening ended at nearly 5am, hence the late posting of this missive usually dedicated to Currencies Direct. Today it is dedicated to all my friends that have made this weekend so memorable. & flaring his tight little kilt. Will I ever get back to sleep , with this vision in my mind ? Sorry missed yesterday but two terrific limericks. Love yours today as well Helen though, as you say, not a pleasant thought !! Chris was blindfold, which sounds somewhat rash ! 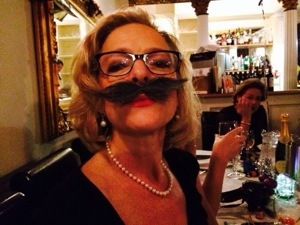 To be faced by a room full of ‘tache !! Sounds a great evening !! Bravo Rev. Brilliant as usual .